123Tune Electronic Distributor to replace Ducellier distributors on Citroen, Peugeot, Alfa models. If you want to tune your engine, or you have an engine for which there is no standard distributor available.....the new 123TUNE is the answer ! 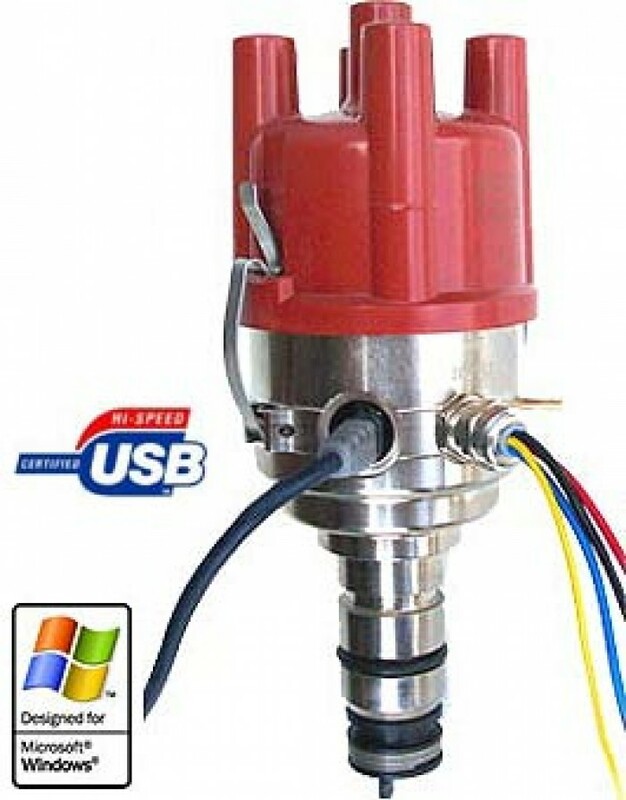 By connecting it to a computer, the end-user can easily adapt the 123TUNE to fulfill even the most demanding requirements. The unit offers two sets of curves that can be selected by placing 12 Volt on a wire from the 123TUNE. The six-cylinder model, can be supplied with a top-entry or with a side-entry cap. ( not interchangable! ) Click here to view the instruction manual. The latest version of the 123TUNE software is 1.4.2 download it now (31 Mb installer). Here are all the features offered : - rotation CW and CCW ( autodetect ) - for 6 Volt and/or 12 Volt cars ( autodetect ) - for positive and negative earthed cars ( 123TUNE-8 is for neg.earth ONLY ) - two centrifugal advance curves ( 500 to 8000 rpm ) - two vacuum-advance and boost-retard curves ( 0 to 200 kPa or -30 inHg to +15 psi ) - two MAP-start fields - two rev.limiters ( advanced random spark stealing ) - real-time tuning under keyboard-control ( ideal for working on a rolling road ) - rpm-stopwatch ( ideal for tuning using the road itself as a rolling road ) - luxurious import-from-file and export-to-file ( curves can easily be exchanged over the internet ) - electronic dashboard with : temperature gauge ( selectable in degrees Celsius or Fahrenheit ) manifold pressure ( selectable in Bar or inches Hg / Psi ) rev. counter ( 0 to 8000 rpm crankshaft ) spark-energy gauge ( primary coil current ) total-advance gauge ( in degrees crankshaft ) - available in 4- , 6- and 8- cylinder models with various sizes and shapes.